Do you have ancestry in New South Wales? 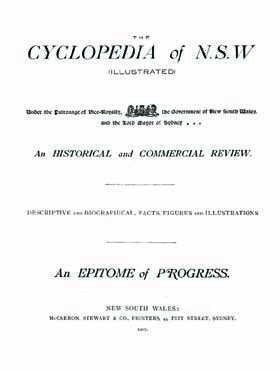 The Cyclopedias that were published for most states of Australia around the beginning of the 20th Century are a significant resource of historical and biographical information on the state concerned - the people, industries, professional, commercial and social institutions and much more. Aside from being a fascinating read for social historians, this is a terrific genealogy resource for anyone exploring their family history or building a family tree.